Sheffield Eagles' players celebrate a try for Oliver Davies against Swinton Lions. 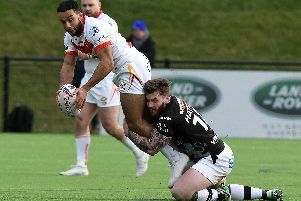 The new signings may have grabbed the pre-season headlines, but it was perhaps one of last season’s forgotten men who stole the show for Sheffield Eagles in their demolition of Swinton Lions. 2018 was a largely forgettable year for Oliver Davies, who was constantly on the periphery of director of rugby Mark Aston’s plans, despite his side’s Championship struggles. 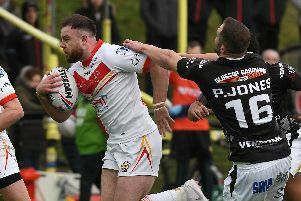 With an influx of new signings during the close season, many would have feared for the former St Helens ace, but Davies has taken up the challenge, impressing Aston and his staff during pre-season. He impressed sufficiently to make the starting 13 last Sunday, and his barnstorming display was one of many stand-out performances on a positive day for the club. Aston was quick to fire praise in Davies’ direction, admitting his attitude to pre-season has been first class. “I must single him out,” Aston told The Star. Davies bagged the opening try of the game, before breaking the Swinton line on countless occasions as the Eagles put their opponents to the sword. Linking up with debutant Anthony Thackeray, who helped himself to four tries, the duo were a constant thorn in the side of the Lions, who could not hold back the Eagles’ tide. Meanwhile, Swinton’s ex-Eagle Will Hope, who was carried off on a stretcher after just 25 seconds at the OLP with a serious ankle and leg injury, has revealed his frustration with his post-game wait for an ambulance. Hope was forced to wait on a stretcher for three hours without an ambulance arriving, and in the end was taken back to Salford Royal Hospital on the team coach. In a post on twitter he called on the RFL to improve support, and went on to thank both Swinton and Sheffield for their assistance.